Yawning is a reflex. It is the simultaneous inhalation of air and stretching of the eardrums, followed by exhalation of breath. Yawning is a reflex. During a yawn, we open our mouth wide, resulting in the stretching of the eardrums while inhaling air at the same time, and then exhaling the air. Yawning is not always collaborated by stretching. The act of yawning and stretching simultaneously is called pandiculation. Yawning is a very common reflex, one that is shared by adults, children, and even other animals. In adults, yawning occurs mainly when one is tired, stressed, overworked or bored. It also occurs most commonly before and after sleep. It also occurs, when we see or hear someone else yawning. However, recent studies have shown that perhaps yawning has more to do with cooling of the brain, rather than tiredness or boredom. A theory states that yawning occurs when there are increased amounts of carbon dioxide in the blood. Hence, the yawning forces us to take big gulps of oxygen, and to exhale the carbon dioxide. Another theory states that a yawn’s main purpose is to stretch the muscles in the jaw, tongue and throat, as they are some of the most overused muscles in they body. They are used for talking, breathing and swallowing. Some state that perhaps nervousness about an impeding action causes one to yawn. According to some anecdotal evidence, yawning may help increase the state of alertness of a person, which would help in the impeding action. Whereas, a research study shows that perhaps yawning may be a way to regulate body temperature, specifically temperature of the brain. Another study also showed that when one yawns while wearing earplugs, a breeze can be heard as caused by the flux of the air moving between the ear and the environment. Another hypothesis states that yawning is caused by the chemicals in the brain, such as serotonin, dopamine, glutamic acid, and nitric oxide, which affect emotions, mood, appetite, and other phenomena. Another belief is that yawning might be a herd instinct. It may help to synchronize mood within a group of animals, similar to the howling of the wolf pack. 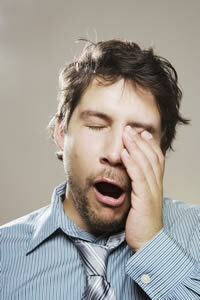 Yawning might show tiredness within a group and indicate that is time to sleep, hence synchronizing sleeping patterns. According to the National Institutes of Health, excessive yawning may also be a sign of disease. It doesn’t necessary indicate anything seriously wrong, however excessive yawning without sleep deprivation, could be a reaction caused by the vagus nerve, which could indicate a heart problem. In some rare cases, excessive yawning may indicate a number of brain problems.